Effect of Classical Instrumental Music on Successive Divided Attention Tests in Indian and Malaysian First Year Medical Students - ARandomized Control Trial : Shantala S. Herlekar and Savitri Siddangoudra ...2. Study of Association between Body Mass Index and Sleep Quality Among Indian College Students : Meena Mirdha, Rajiv Nanda, Hanjabam Barun Sharma and Hruda Nanda Mallick ....8. Effect of Alternate Walking and Yoga on Blood Sugar Levels in Type 2 Diabete : K. Esha, S. Prajakta, S. Ashok and S. Parag ....16. Reliability and Effect of Submaximal Aerobic Exercise Test to Assess Cardiac Autonomic Response in Female Normotensive Offspring of Hypertensive Parents : Sujoy Mukherjee, Anindya Roy, Goutam Banerjee and Anil Baran Singha Mahapatra ....21. Channelizing the Existing Perceptions of Medical Students Towards Reflective Learning: ANew Insight : Madhuri Taranikanti, M. Aswin Kumar, P. Karuna Sree, G. Rohith Kumar, Mohd. Ismail Khan and M. Srinivas ....30. 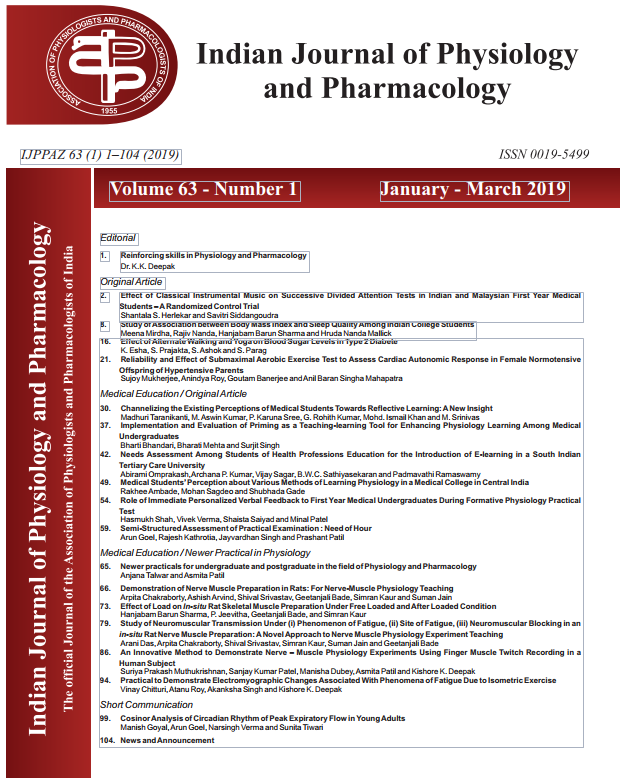 Implementation and Evaluation of Priming as a Teaching-learning Tool for Enhancing Physiology Learning Among Medical Undergraduates: Bharti Bhandari, Bharati Mehta and Surjit Singh ...37. Needs Assessment Among Students of Health Professions Education for the Introduction of E-learning in a South Indian Tertiary Care University : Abirami Omprakash,Archana P. Kumar, Vijay Sagar, B.W.C. Sathiyasekaran and Padmavathi Ramaswamy ....42. Medical Students' Perception about Various Methods of Learning Physiology in a Medical College in Central India : Rakhee Ambade, Mohan Sagdeo and Shubhada Gade ...49. Role of Immediate Personalized Verbal Feedback to First Year Medical Undergraduates During Formative Physiology Practical Test : Hasmukh Shah, Vivek Verma, Shaista Saiyad and Minal Patel ....54. Semi-Structured Assessment of Practical Examination : Need of Hour : Arun Goel, Rajesh Kathrotia, Jayvardhan Singh and Prashant Patil ....59. Newer practicals for undergraduate and postgraduate in the field of Physiology and Pharmacology : Anjana Talwar and Asmita Patil ....65. Demonstration of Nerve Muscle Preparation in Rats: For Nerve-Muscle Physiology Teaching : Arpita Chakraborty, Ashish Arvind, Shival Srivastav, Geetanjali Bade, Simran Kaur and Suman Jain ....66. Effect of Load on In-situ Rat Skeletal Muscle Preparation Under Free Loaded and After Loaded Condition : Hanjabam Barun Sharma, P. Jeevitha, Geetanjali Bade, and Simran Kaur ....73. Study of Neuromuscular Transmission Under (i) Phenomenon of Fatigue, (ii) Site of Fatigue, (iii) Neuromuscular Blocking in an in-situ Rat Nerve Muscle Preparation: ANovel Approach to Nerve Muscle Physiology Experiment Teaching : Arani Das, Arpita Chakraborty, Shival Srivastav, Simran Kaur, Suman Jain and Geetanjali Bade ....79. An Innovative Method to Demonstrate Nerve – Muscle Physiology Experiments Using Finger Muscle Twitch Recording in a Human Subject : Suriya Prakash Muthukrishnan, Sanjay Kumar Patel, Manisha Dubey, Asmita Patil and Kishore K. Deepak ....86. Practical to Demonstrate Electromyographic Changes Associated With Phenomena of Fatigue Due to Isometric Exercise : Vinay Chitturi, Atanu Roy, Akanksha Singh and Kishore K. Deepak ....94. Cosinor Analysis of Circadian Rhythm of Peak Expiratory Flow in Young Adults : Manish Goyal, Arun Goel, Narsingh Verma and Sunita Tiwari ....99. XXXVII Annual Meeting of Indian Academy of Neurosciences : .....104.